Kamorta Class vessels are the first indigenous Anti-submarine Warfare (ASW) corvettes of the Indian Navy. Four Kamorta Class ASW corvettes are scheduled to enter service by 2017. The third Kamorta Class ASW corvette, INS Kiltan, was launched in March 2013. Kamorta Class indigenous Anti-submarine Warfare (ASW) corvettes are being built by Garden Reach Ship Builders and Engineers (GRSE), for the Indian Navy. Four of the corvettes constructed under Project 28 (P-28) are scheduled to enter service by 2017. The Kamorta Class succeeds the Kora-Class guided-missile corvettes that are in service with the Indian Navy. The Kamorta Class corvettes will serve as the frontline warships for the Indian Navy. Primary task of the Kamorta Class will be ASW, while the vessels will also be deployed in anti-surface warfare (AsuW) and anti-air warfare (AAW). The Indian Navy placed an order for the construction of four indigenous corvettes in 2003. 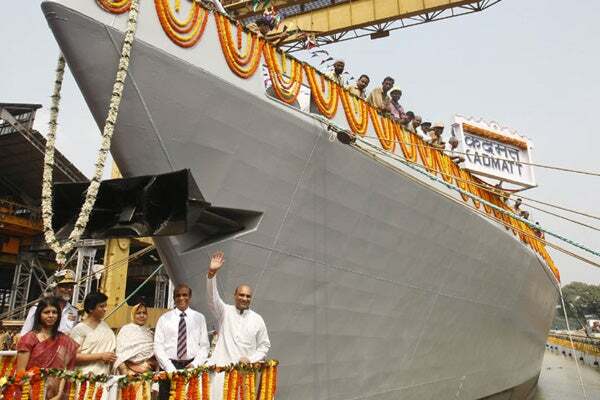 The keel for the lead corvette in class, INS Kamorta, was laid down in November 2006. It was launched in April 2010 and commissioned into the Indian Navy in August 2014. Kamorta experienced engine and steering gear malfunction during trails in October 2013. The second vessel, INS Kadmatt, was laid in September 2007 and launched in October 2011. It was commissioned into service in January 2016. The keel for INS Kiltan was laid down in August 2010 and the ship was launched in March 2013. The last ship in class, INS Kavaratti, was laid in January 2012 and launched in May 2015. Project 25A Kora Class guided missile corvettes were built by Garden Reach Shipbuilders and Engineers for the Indian Navy. The Kamorta Class features high-tensile indigenous steel hull incorporating a superstructure made of indigenous DMR 249A steel and carbon fibre reinforced plastic (CFRP) materials. The hull and superstructure are designed to achieve low radar cross section. The stealthier hull form is designed to deliver excellent seakeeping and manoeuvrability characteristics while also ensuring lower noise and vibration levels. The ASW corvette includes indigenous content of about 90%. The corvette has an overall length of 109.1m and breadth of 12.8m. The standard displacement of the vessel is 2,500t. The ship complements a crew of 123 people, including 17 officers and 106 sailors. The OTO Melara 76mm Super Rapid Gun Mount (SRGM) on the bow deck will deliver a rate of fire of 120 rounds a minute. The gun can fire standard ammunition for a maximum range of 16km. Two AK 630 close-in weapon systems (CIWs), each mounted on either side of the deck, provide close-point defence against anti-ship missiles, precision guided weapons, low flying fixed or rotary wing aircraft, and small craft. The Kamorta Class is installed with a 16-cell vertical launching system (VLS) for firing Barak surface-to-air missiles (SAMs). The Barak SAM system can strike anti-ship missiles, fixed and rotary-wing aircraft, as well as UAVs. The RBU-6000 (IRL) anti-submarine rocket launchers and triple torpedo tubes mounted on the vessels ensure the engagement of enemy submarines. The Kamorta Class integrates Revati 3D surveillance radar, fire control radars and HUMSA (Hull Mounted Sonar Advanced). The countermeasures against various incoming missiles are provided by Kavach naval decoy system. The electronic warfare system (EWS) fitted on the vessel further enhances the survivability. "The countermeasures against various incoming missiles are provided by Kavach naval decoy system." The stern landing deck can support the operation of a single helicopter. The Kamorta Class corvettes are the first Indian Navy ships to be equipped with rail-less helo traversing system and foldable hangar door. The Kamorta Class is powered by a combined diesel and diesel (CODAD) propulsion system integrating four 3,888kW main diesel engines, two controllable pitch propellers and noise-suppressing raft-mounted gearbox. The shipboard power is provided by four diesel generators supplied by Wartsila. The Kirloskar Engines, the licensee of SEMT PIELSTICK of France, delivers the engines, while raft-mounted gearboxes are supplied by DCNS. The propulsion system provides a maximum speed of 25k and a range of approximately 3,450nmi at a speed of 18kt.